As the official sponsor, AAI Worldwide will also be providing logistics support to mount the upcoming Ironman series from 2018 to 2020. 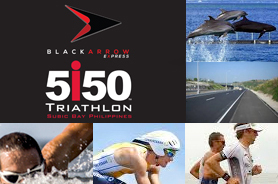 Black Arrow Express, which is the “last-mile” and consumer company of the AAI Group will be a Title Sponsor and will launch its own Black Arrow 5i50 triathlon series in the same years. The Ironman in the Philippines is the only other sanctioned Ironman event in the Southeast Asia region apart from Langkawi, Malaysia. The event is expected to bring in thousands of participants from all around the globe. The AAI Group of Companies (AAI Group) is a network of corporations that embodies the Total Logistics organization offering the full range of logistics solutions from large size and volume shipments, storage and handling, all the way to retail express delivery covering the Philippine archipelago. From its founding in 1981 as Airlift Asia Inc., the AAI group has grown beyond cargo handling for the semiconductor industry to logistical services and operations provision for practically anything and everything imaginable, covering 5 grams to 5,000 tons. •	AAI Charity – The corporate social responsibility (CSR) arm of the group, providing scholarships, philanthropy and advocacy for the community. AAI Group’s main base of operations is in the AAI Freight Management Center in Parañaque City, Metro Manila, Philippines, and has state of the art facilities for warehousing, distribution hubs and equipment pools throughout the country.